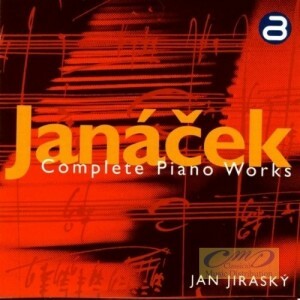 Complete Piano Works - Leoš Janáček - Mediální ohlasy - ArcoDiva management - Hudební agentura - Hudební agentura ARCO DIVA Management s.r.o. A vastly laudable project that includes a real bonus. V mlhách and Vzpomínka are heard twice (once on each disc), the first time played on Janáček’s own piano, and secondly on a modern concert grand; the actual make is unstated. More of that soon, but let it be stated first and foremost that the value of this enterprise lies in Jiraský’s eminently musical approach to these works. They seem to be receiving more and more recorded exposure although concert performances still seem rare, at least in the UK. The set begins with the two works for piano and ensemble. First is the Capriccio for piano left hand, flute, two trumpets, three trombones and tuba, as strange a combination as you are likely to meet. Yet it works supremely well, thanks to Janáček’s supremely keen aural imagination. The work opens in distinctly Neo-Classical mode. The staccato brass, march-like, make Stravinsky seem remarkably close by, yet with a Czech accent. This is quirky but endlessly fascinating music, especially when played like this. Jiraský’s articulation is pearly-clear, and some of the brass playing is jaw-droppingly good - trumpets especially.